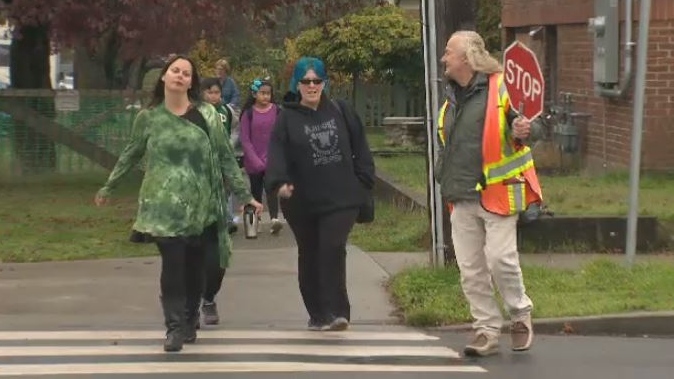 The number of near-misses between kids and cars at a Victoria elementary school has parents demanding new measures to slow speeders down. At George Jay Elementary, parents are worried about their kids crossing Cook Street in the early morning and afternoon – and for good reason. "A lot of close calls," said crossing guard Denis Robichaud. "Holding the kid back, and if I didn't hold the kid back, he would be under the vehicle." It's a recurring theme at the Cook Street crosswalk, between Princess and Queens avenues. It has no lights and only relies on crosswalk markings, signs and Robichaud to stop traffic. Several parents who spoke with CTV News Wednesday morning shared their own frightening stories. "I have witnessed one parent that actually had to flag down one of the cars when she was crossing and they weren't going to stop," one woman said. The president of George Jay's Parent Advisory Council says a child has even been struck when trying to cross Cook Street on the way to school – and that something needs to change. "I understand that this is a through-way and it's a really busy time of day, but there are 500 children coming to this school from all directions, so we really, really need people to be aware of that," said Angela Carmichael. She says the main problem is people speeding through the 30 kilometre an hour school zone, and believes the solution has to do with infrastructure. "Light this crosswalk, expand our school zone," she said. "And then just our Queens Street here, we need a crosswalk there." City officials are listening and say they'll investigate the traffic complaints, but improvements that would range in cost from the thousands to the hundreds of thousands won't be made without data to back them up. "Without actually doing an evaluation, it's difficult to say where the results would end up," said Brad Dellebuur, Victoria's assistant director of transportation. "Generally we'll look at the number of gaps. If there are insufficient gaps in traffic for pedestrians to have a safe crossing environment, then additional interventions are made." But adding infrastructure won't necessarily make an intersection safer, according to the city. "The difference between driving 30 kilometres an hour and driving 50 kilometres an hour through there is about 10 seconds on your commute," said Dellebuur. Crossing guards at other schools say school zone speeders isn't just a problem at George Jay. "It's amazing how fast they go," said Linda Griffin, who patrols the crosswalk at South Park Family School on Douglas Street. "Even when you're in the crosswalk, they're still coming right up and basically touching you."